I don’t usually post gamer cakes like this Super Mario Bros. cake, or promote anything that in any way could be mistaken as “cute” (since cute things are notoriously rife with a variant of cooties that are deadly to testosterone), but cake artisan Nely won me over with her faithfulness to content and spirit of the source material. And really, isn’t faithfulness to the content and spirit of the source material what you’re looking for in a theme cake? I mean, after you’ve established that there’s no stripper inside of said cake. Obviously. My daughters told me they already knew your blog. 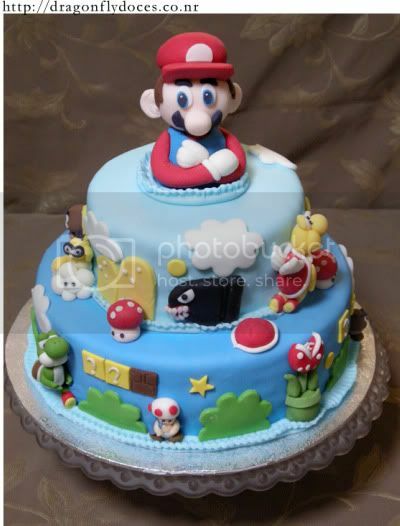 The Mario cake was made for a 5 year old boy who is a great fan of the games, the cake was a normal spongcake with White Chocolate and Passion Fruit filling (I live in Japan, but work mainly the brazilian people who live here, and we are very fond of this kind of flavor). It was covered with fondant and all the details (the Mario figurine included) were made with gumpaste. Just as I suspected. I am huge amongst the Brazilian population of Japan. Which would explain all the Hello Kitty dolls wearing g-strings that I’ve been receiving in the mail. Check out more views of the cake in Nely’s Flickr photostream and visit her Web site, where you can learn to say “marzipan” in Portuguese. Which could possibly come in handy if you’re planning any fetishistic trips to Brazil in the near future. Sweet cake! But for a 5-year old? Give it to someone who would truly appreciate the craft and sophisticated flavors. Someone like me.